Today's Throw-Back Thursday selection is from author Matthew Pearl. I've been a fan of this author since his debut novel, The Dante Club, published in 2003. He has been referred to as a master of the popular literary historical thriller. I would add mystery onto that, as in thriller/mystery. His other fiction books include The Poe Shadow, The Last Dickens, The Technologists, and The Last Bookaneer. He has also written some non-fiction books, and lots of short non-fiction and short fiction. His next novel will be out the summer of 2018 and is entitled The Dante Chamber, a sequel or connected story to his first novel, The Dante Club. 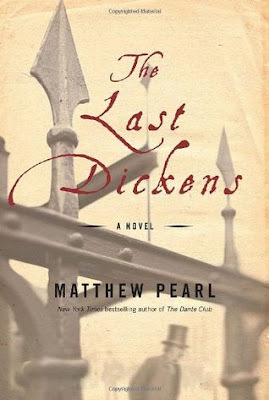 Today I'm featuring Pearl's The Last Dickens. So, here's look back at a favorite book of mine some readers might have missed. Thanks so much Kathy! Really appreciate your kind words for The Last Dickens and spreading the word! Matthew, it's a pleasure to feature you on my blog. Thank you for taking the time to comment. It's something that means a lot to bloggers. I do want to apologize for my short review of The Last Dickens. I was not doing the lengthier reviews I do these days, and so I know I didn't do it justice. I'd love to do a short interview with you when your new book comes out, if you can find the time. I would send you the questions. Again, I'm so happy that you stopped by the blog.